Founded at Florida Tech in 1968, F.I.T. Aviation is the home of all university aviation operations, from ground school and air traffic control to simulation and flight instruction. It is a wholly owned subsidiary of Florida Tech and is located at the Melbourne International Airport field, minutes from the university's beautiful residential campus. With outstanding flight instructors and an unparelleled maintenance and safety program, as well as the latest technologies in flight training and modern facilities, F.I.T. Aviation offers the very best in aviation education for future pilots who aspire to achieve distinction and excellence as professional aviators. Cultivating industry-leading expertise in aeronautics and flight. Developing career-ready skills in all aspects of modern aviation. Nurturing an attitude of integrity coupled with a safety-first mindset. Florida Tech is one of the elite few private universities to offer undergraduate aeronautics degree programs with flight options and F.I.T. Aviation is proud of its role in these exciting programs. You will find Florida Tech graduates working in nearly every airline as well as in airports, training centers, safety agencies and aviation companies all over the world. We invite you to visit F.I.T. Aviation in person to experience the excellence we bring to flight training. Human Factors & Safety, B.S. 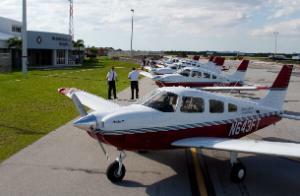 Florida Tech and Grumman Aerospace and its former CEO, George Skurla, have deep connections stretching back decades that helped shape both institutions. Thanks to an aid efforts led by Florida Institute of Technology, thousands of pounds of medical supplies, food and generators were flown directly to hurricane-ravaged Puerto Rico. Aviation businesses such as Lockheed Martin and Rockwell Collins will have informational displays, and hands-on experiences will be offered, as well. Chesapeake Gustin and Sherisse Pierre will fly 2,600 miles from Maryland to New Mexico as participants in the 41st annual Air Race Classic.